The idea of a boat trip as a daily activity is, in some ways, peculiar. In the past, boats were the only means of transportation across long distances. These journeys would last months and are associated with extended farewells and waving goodbye, long-term expeditions and world discoveries. This particular ferry however, goes back and forth several times a day, each trip taking about 5 minutes. It repeats the same cycle systematically, constantly departing and arriving. The journey becomes mechanical, overlooked and trivial. ‘Farewell’ is a project developed for the Houthavenveer, the ferry that connects the Tasmanstraat in Amsterdam West with the NDSM area in Amsterdam North. The project addresses the connection between a regular ferry trip with the broader history of boat travel. 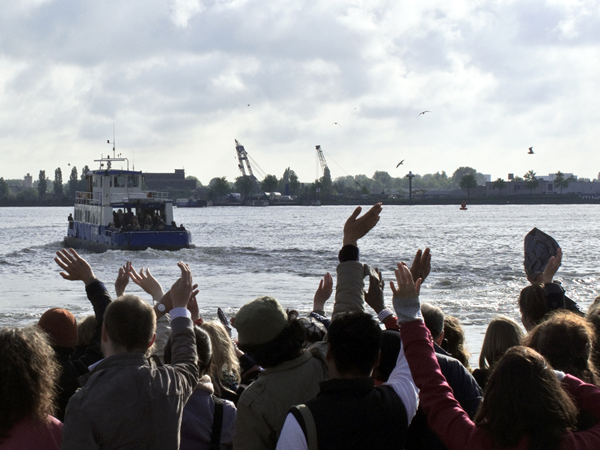 On May 18, 2010, thirty-four people bade farewell to the ferry. Standing on the edge of the quay they waved goodbye to the people on board. This gesture was repeated every time the ferry departed during the morning rush hour. The people who arrived at the dock encountered the farewell committee unexpectedly. The project attempted to break the ferry passenger’s daily routine and transform a trivial activity into an unusual event. This project has been realized with the generous support of Amsterdams Fonds voor de Kunst and Fonds BKVB.